The 70-643 Real Practice-Lab will provide you the necessary platform to gain hands on skills in Windows Server 2008 R2. By completing the lab tasks you will improve your practical skills in deploying servers, remote desktop services, web services infrastructure and network application services. Becoming proficient in these tasks will also help you understand the objectives and competencies required by the MCTS: Windows Server 2008 Applications Infrastructure, Configuring certification exam. Using the Real Practice-Lab to its full potential will help you develop your skills in either becoming a server administrator or help you develop your current skill level. Once you have used the lab for either 25 / 50 or 100 hours we will acknowledge this achievement by issuing you a certificate. This can be validated by potential employers or managers alike. Deploying Servers: This is a very common task carried out by server administrators. Whether new servers are required by a business project or old equipment is being replaced. Instead of building the server by CD/DVD which does not always deliver consistent results and is susceptible to human error. Using you Real Practice-Lab you can install and configure Windows Deployment Services which enables you to build system images that you can use to deploy servers quickly and easily. In your lab you can also test other deployment tools like the Microsoft Windows activation and Windows Server Hyper-V. Remote Desktop Services: Microsoft Windows Server 2008 R2 has some new enhanced features around providing remote working solutions. This is a very important as organisations look to centralise there IT services. 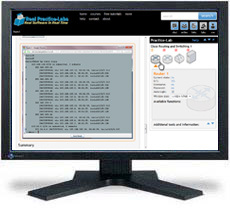 In your Real Practice-Lab you can deploy and test all aspects of RemoteApp / Remote Desktop Web Access. Also experiment with and understand Remote Desktop licensing and monitoring. Web Services Infrastructure: A larger proportion of internet websites and organisation intranets are hosted using Microsoft IIS. Using your Real Practice-Lab you will discover all of the services that make up Microsoft Internet Information Services, this will not teach you how to make a website look pretty but the underlying infrastructure to make it run optimally. Using the lab you will be able to configure web applications, manage web sites, manage web site authentication / permissions and configure SSL security. You will also discover how to configure a FTP server and learn more about the Simple Mail Transfer Protocol (SMTP) in IIS. Network Application Services: Services: Microsoft Windows Server 2008 R2 comes with a number of additional services that can be deployed if required. These services can be installed, tested and explored in your Real Practice-Lab, things like Streaming Media Services role and SharePoint Foundation are available to you.